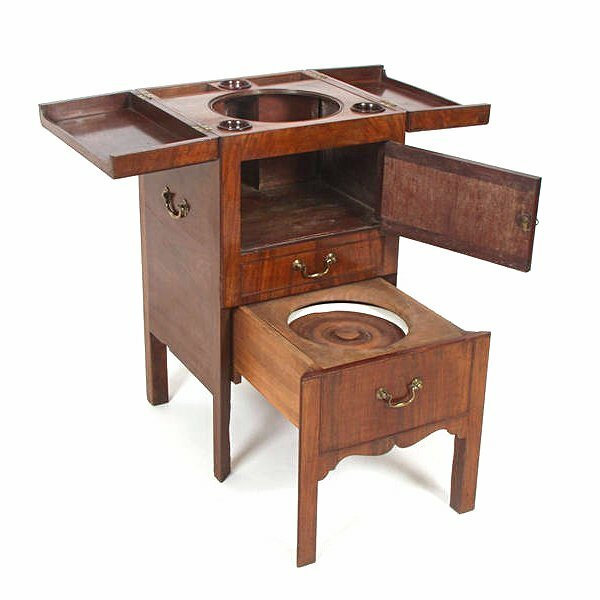 We largely tend to take the lavatory for granted nowadays, but in pre-Victorian times, the average person’s daily constitutional would have likely involved varying levels of discomfort, draughts and conspicuousness in the open landscape. If one had the means, one might have undertaken a potentially hazardous journey, through rows of artichokes and Brussels sprouts, to arrive at some form of latrine at the bottom of the garden; or perhaps enjoyed the relative, but still atmospheric opulence of a garderobe (fig. 1). Both types of convenience would have been built above a cesspit that required periodic emptying by some unenviable serf. Fig. 1. 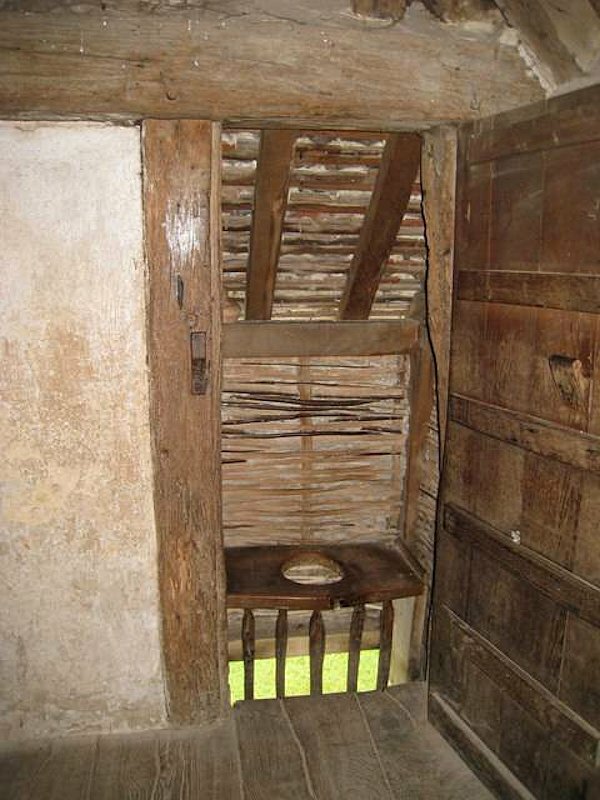 First-floor garderobe, sixteenth-century Wealden house, Sussex. Urban dwellers, of average or below average means, would have insulted a pottery receptacle or ‘pot’ and then either hurled its contents into an open drain running down the street, or emptied it into a cesspit below stairs for later collection and disposal by a gong farmer or night soil collector. Fig. 2. 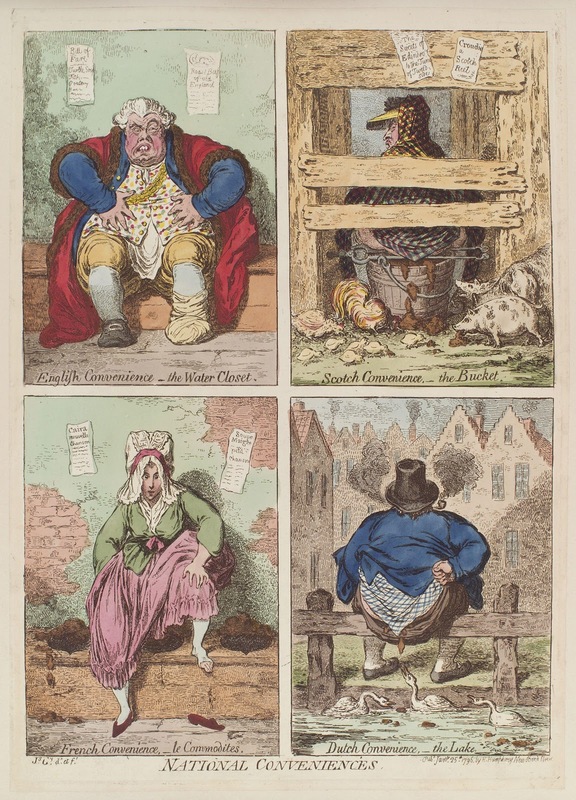 James Gillray, National Conveniences, circa 1796. Not wanting to miss a moment of excessive conviviality, Georgian diners didn’t remove themselves from the dining room to relieve their bladders: Gentlemen would request a small chamber pot or ‘piss pot’ (fig. 3) from the cupboard in the sideboard and unabashedly drain themselves as the other guests continued unabated. Fig. 3. 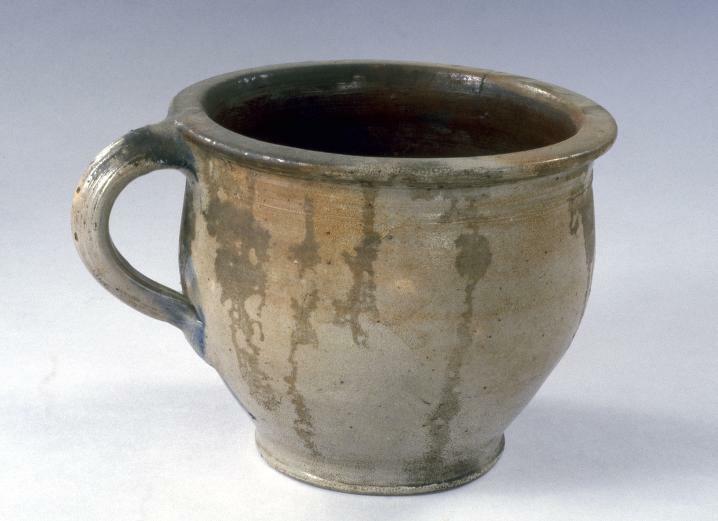 Small earthenware piss pot, circa 1800. Fig. 4. 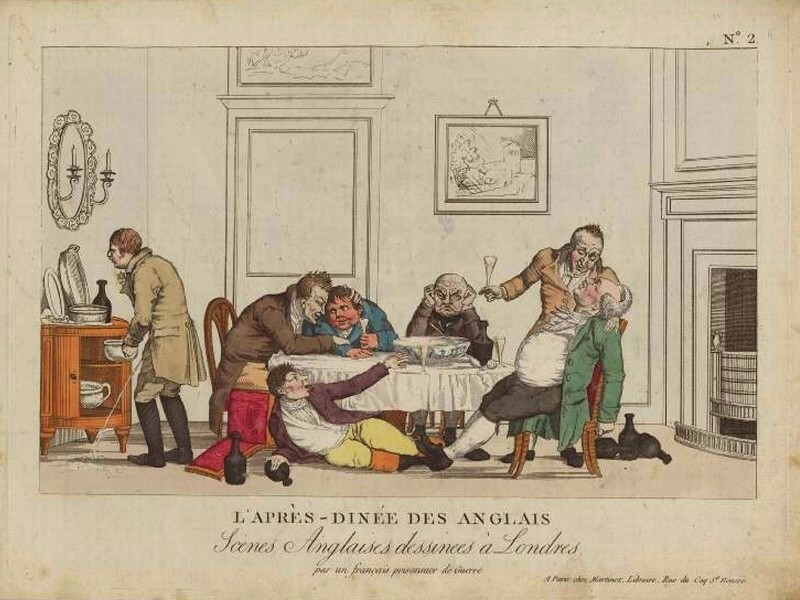 How the French perceived English diners, circa 1814. Women, similarly caught short, would either scurry behind the curtains or a folding screen, pot-in-hand, or their maid would fetch an ergonomically-shaped bourdaloue which they would immodestly thrust beneath their petticoats (fig. 5). Fig. 5. François Boucher (1703-1770), La bourdaloue. Fig. 6. 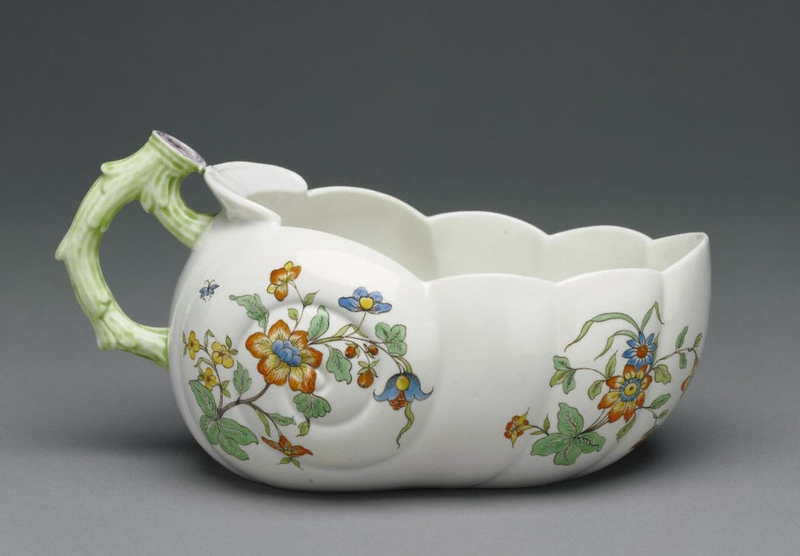 Chantilly porcelain bourdaloue, circa 1740. 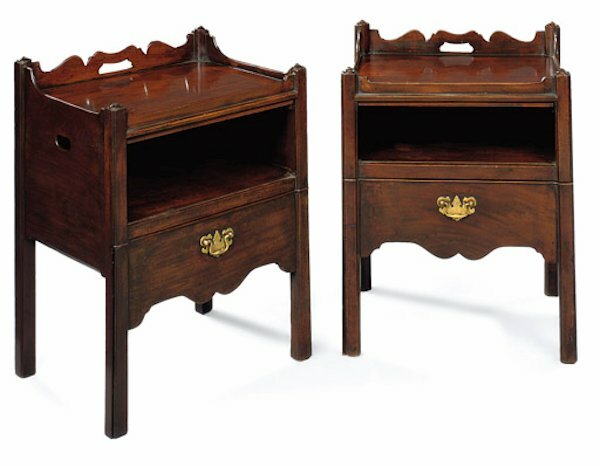 Known also as ‘necessary stools’ and ‘night stools’, these amenities were the preserve of those who could afford such singularly indulgent furniture. Close stools invariably have a hinged lid concealing a seat that either supports a handle-less earthenware pot or, beneath a hole in which, a handled pot is placed and accessed by removing the seat, or via a door in the front of the stool (figs. 7 & 8). Fig. 8. William III’s velvet-covered close stool, Hampton Court, circa 1690. 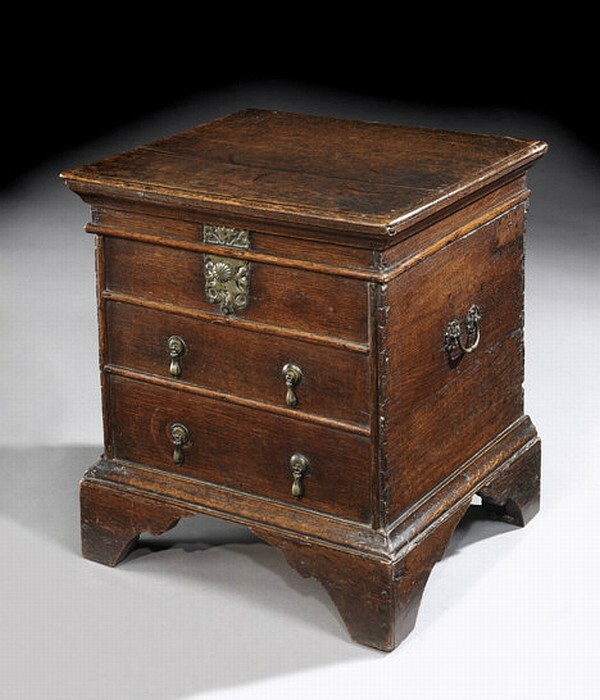 Some noted close stools were equipped with locks which, one might surmise, were to prevent vassals from covertly partaking of their masters’ extravagance, but in the case of the Hampton Court close stool, the lock was essential to deter miscreants from stealing William’s faeces. When dried, the King’s ordure was highly sought after by gasconading souvenir hunters of the day. More recently, an authenticated portion of Henry VIII’s dried faeces sold at auction in New York in 1996 for the sphincter-puckering sum of $1,650. 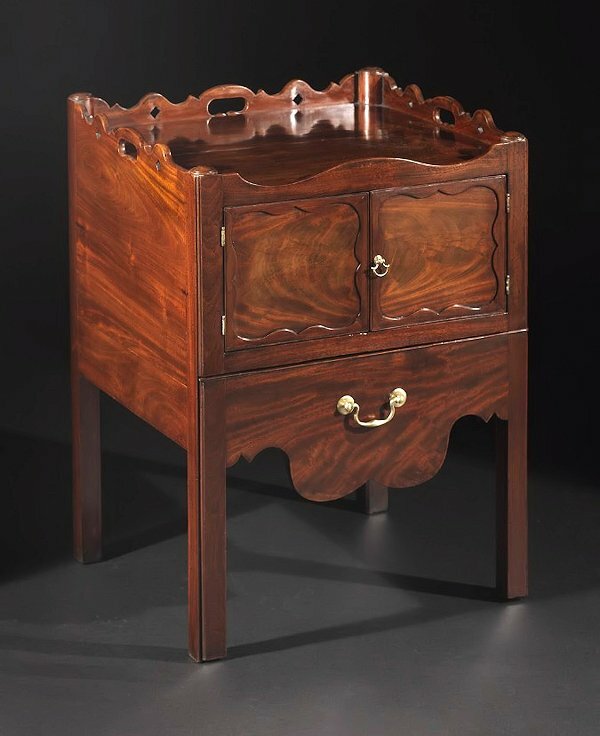 A common feature of Georgian bedchamber privy furniture were the aprons which, identifiably shaped like the human posterior (figs. 9, 10, 11, 12 & 13), left those who felt a deep nocturnal or auroral urge in absolutely no doubt as to the purpose of the contraption. Fig. 12. 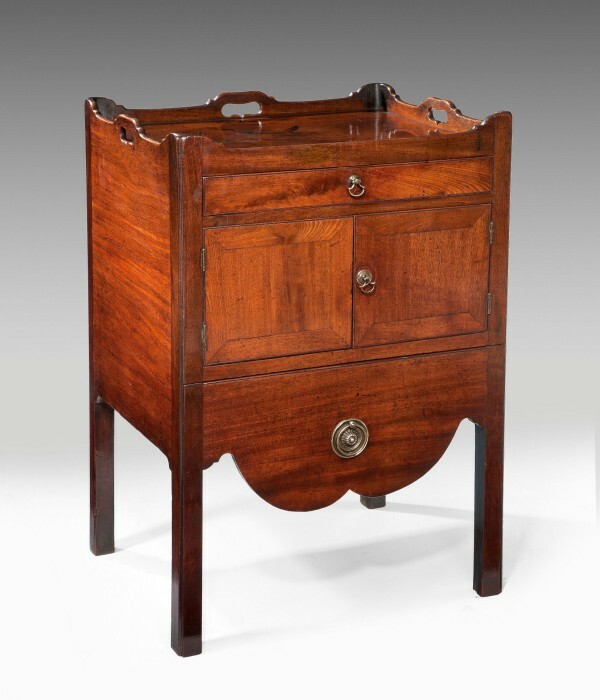 Circa 1800 mahogany night table with pull-out buttocks-shaped commode. Fig. 13. For the newlyweds – matching his and hers night tables. 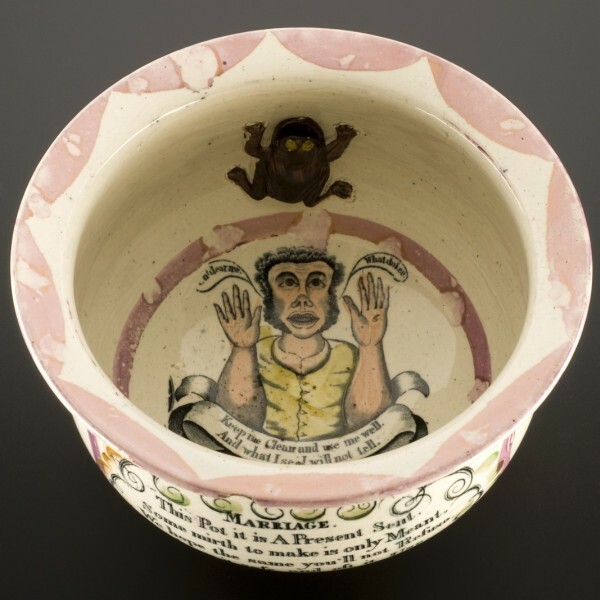 The Georgians were fond of their lavatorial humour: Chamber pots often contained amusing verses and the occasional ferly addition (figs. 14, 15 & 16). Fig. 14. 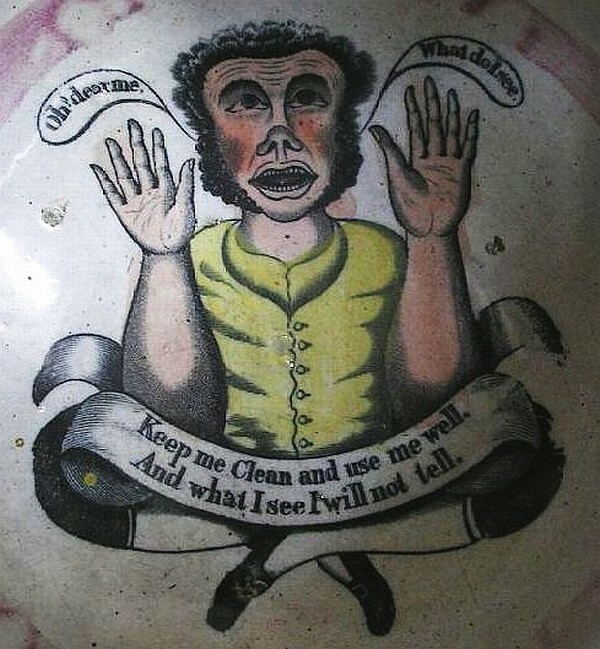 Staffordshire pot with verse, cartoon and moulded frog. Fig. 16. 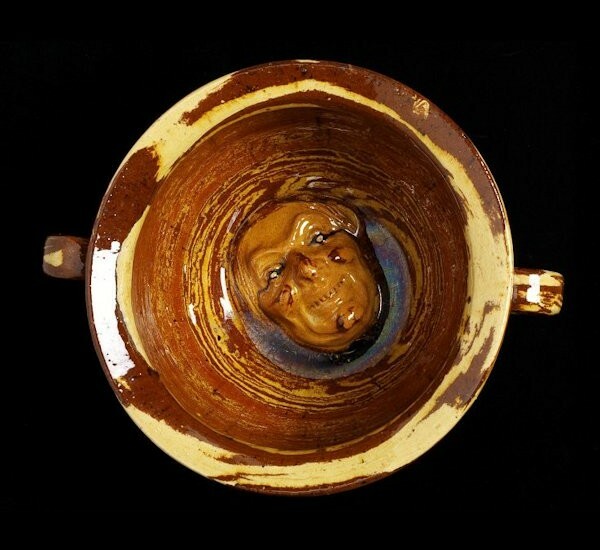 Slipware pot with moulded grinning face looking up. 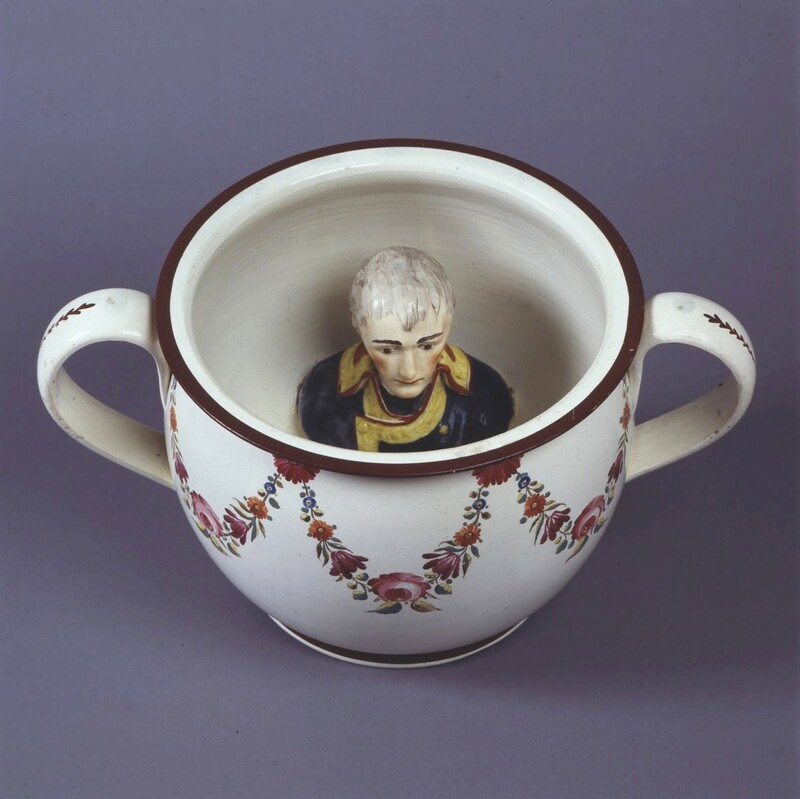 One occasionally sees pots containing effigies of individuals of widely held derision such as Napoleon Bonaparte (fig. 17). Their disparagers could glean some satisfaction from urinating and defecating on the subject’s head. Fig. 17. 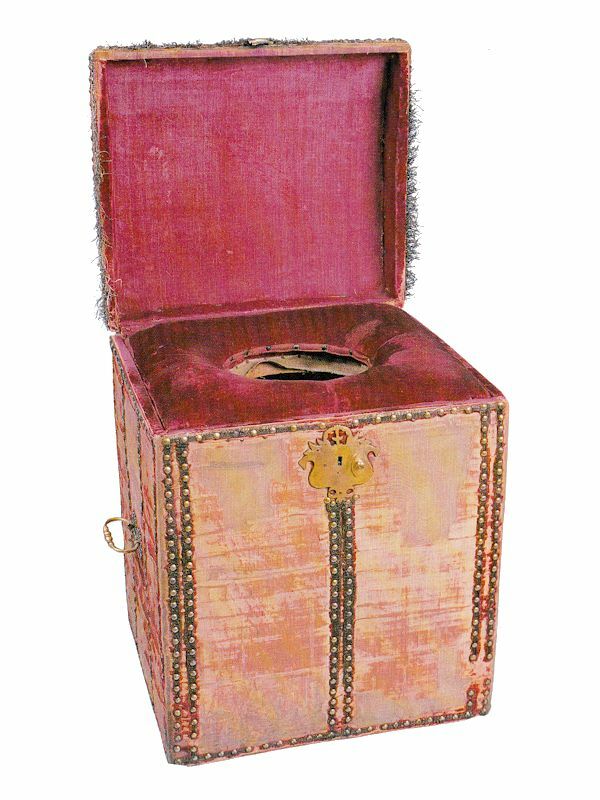 ‘Boney’ in a potty, circa 1815. Thankfully a close stool has not yet appeared in the Proposed Furniture Program, but with advancing years and increased frailty, that could all too easily change. I estimate I still have a few years before deciding on whose noggin I would like in my potty. An anatomically shaped female urinal purportedly named after the French preacher, Louis Bourdaloue (1632-1704), renowned for his bible-bitingly lengthy sermons. This entry was posted in Distractions and tagged bourdaloue, buttocks, cesspit, chamber pot, Chantilly, close stool, commode, constitutional, Francois Boucher, garderobe, gong farmer, Hampton Court, Henry VIII, James Gillray, lavatory, Napoleon Bonaparte, necessary stool, night soil collector, night stool, posterior, potty, privy furniture, Staffordshire pot, William III. Bookmark the permalink. 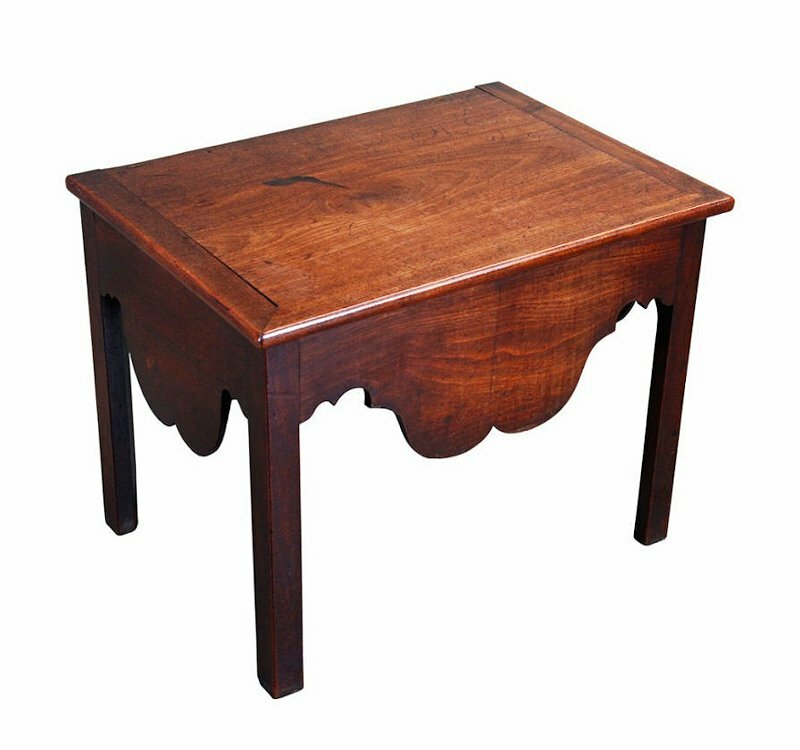 And actually, the Lucy Johnson close stool looks like a piece that I would like to make (for different reasons), because of it’s design possibilities! ps: Thank God for modern plumbing. ^^^^ i second that thanks for modern plumbing. wow, this is totally breathtaking! Amazing. Thanks, Jack. You’ve made my day. I’ve never seen these before, and I am just amazed in a good way, I think. Jack – great stuff! Was the bourdaloue picture from your collection of Georgian gentleman’s magazines? No, for the record, I don’t have any such material! Erm… who told you? Once again your scholarship is unassailable. A very interesting read – probably the best article on how people relieved themselves that I’ve read online :) Great stuff. Never knew about the bottom shaped detailing on the cabinets… Tee hee. I guess the modern version of the bourdaloue is the plastic bottle. get caught short use it, stick it behind the curtains and hope the Mrs does knee find it. Fascinating and curiously interesting. Thanks for taking the time to construct this potted history.